We've come to the end of our Windows 7 The Ease of Setup series; and we've accomplished a great deal over the past 6 weeks. If you've been following along, and have worked through this with me, you should now have Windows 7 installed on YOUR existing PC. Congratulations on a job well done! Now that its installed, you may be wondering, "well, that's just great, Chris… NOW what?! I have no idea where things are or what to do!" No worries, my friends... I've got 7 well timed tips to help you get acclimated to the new OS. With earlier versions of Windows, finding programs or documents wasn’t easy. You often had to search through multiple Program Groups or a huge list of documents to find what you want. With Windows 7 all you need is the Search field in the Start Panel. Click Start, and then type the name of the thing you’re looking for. Windows will show you keyword matches (programs, Control Panel applets, documents, e-mail messages, etc.) from the entire contents of your hard drive. There’s really no need to click Start—Programs anymore. 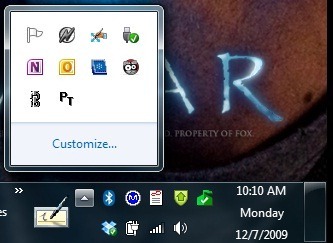 One of the biggest changes to Windows 7 is the removal of the traditional Quick Launch toolbar. Quick Launch is now your Task Bar, and you can add any running program to it simply by right clicking on a running program in the Task Bar and choosing “Pin this Program to the Task Bar.” Once pinned to the Task Bar, you can run a program by clicking its icon. 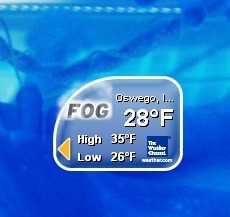 Running programs are differentiated from pinned icons by the rectangular outline around it. 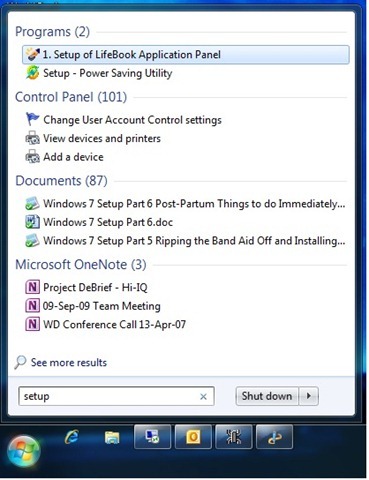 In Vista, the SideBar was a static thing that sat on a chosen edge of your PC’s screen. Gadgets sat in the bar, period. 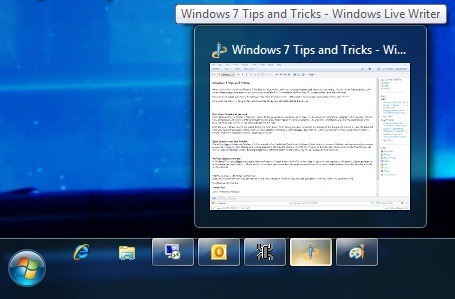 In Windows 7, Sidebar gadgets can sit anywhere you want them to. All you need to do is hover your mouse over the gadget in question until the move handle appears, then click and drag it to the desired location. Since Quick Launch and your Task Bar are one in the same, Windows 7’s System Tray now has the ability to hide all, some or none of its icons. Click the up arrow at the left most end of the System Tray and then click the Customize link on the panel that appears. You can always show, show only notifications or hide tray icons in the resulting dialog box. Getting access to your desktop can be an important thing. Seeing what windows are where and what you’ve got under the active window can help you get organized. If you need to quickly view the desktop, simply hover your mouse over the rectangular button at the right-most end of the task bar. You desktop will appear with all of your active windows outlined. Click the button to quickly minimize all windows. Quickly get to your desktop! Once you find the window you’re looking for, clearing the desktop so that things aren’t so cluttered is easy. Simply grab the task bar on the window you want to KEEP and quickly shake it back and forth. All other active windows will quickly minimize themselves. To restore those windows, repeat the above. Stay tuned! There’s more Windows 7 magic coming up in the future! Thanks to you, I’m pleased to report that Technically Speaking will continue to appear in the Business section of The Beacon-News every Thursday! Thank you for your support!